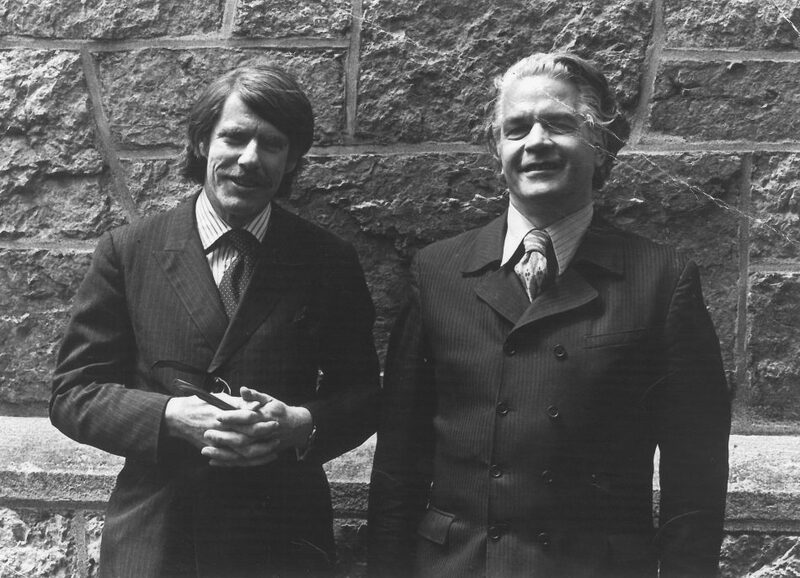 Dracula scholars Radu Florescu (left) and Raymond T. McNally in a photo from the rear dustjacket of their bestselling book In Search of Dracula: A True History of Dracula and Vampires (1972), widely revered for inspiring mainstream interest in Dracula and vampire studies. Readers of Vamped may already be familiar with the fiery dispute that raged for decades between Boston Professors Raymond T. McNally (1931–2002) and Radu Florescu (1925–2014) versus Toronto Professor Emerita Elizabeth Miller (b. 1939), given the honorific Baroness of the House of Dracula by the Transylvanian Society of Dracula, and a leading expert on Bram’s Stoker famous Dracula novel. The core issue is the possible influence of Vlad III Dracula (1431–1476)—a.k.a Vlad the Impaler—on Stoker’s depiction of Count Dracula. While preparing an article for a book about BBEC 2015, the International Conference Beliefs and Behaviours in Education and Culture conference, organized by Marius Crișan in Timișoara (June 25–27, 2015), I found myself digging deeper into the history of this dispute. What I discovered has raised a grisly suspicion with me; I have won the irritating impression that the Boston scholars not only took unproven assumptions for granted, but also may deliberately have distorted information in order to prop up their theories. 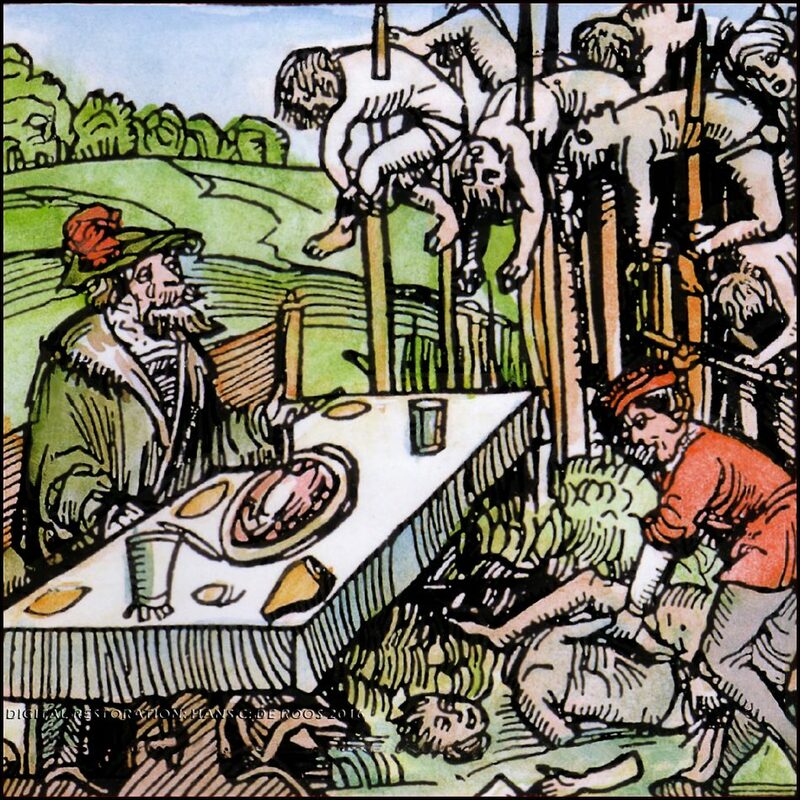 We are talking about a crucial line from a medieval poem that Stoker was allegedly familiar with, which allegedly depicted Vlad III as a tyrant dipping his bread in the blood of his enemies. Feasting among the impaled. A colorized rendering of the woodcut by Ambrosius Huber of Nuremberg (1499). Anthony Hogg has already discussed the horrendous account, spread through two books by McNally and Florescu. Their supposed source was a poem by the German Meistersinger Michael Beheim (1416–c. 1472), Von ainem wutrich der heis Trakle waida von der Walachei (Story of a Violent Madman Called Voïvode Dracula of Wallachia). It was first performed—that means, sung—at the court of the Holy Roman Emperor Frederick III (1415–1493) during the winter of 1463. […] Beheim’s poem [was] the source for Van Helsing’s statement in the novel that he had found a document in which Dracula was described as a blood-drinker – a clear reference to one of Beheim’s verses. In one verse Beheim described Dracula as dipping his bread in the blood of his victims, which technically makes him a living vampire — a reference that may have induced Stoker to make use of this term. But “basically” McNally’s and Florescu’s interpretation of Beheim’s poem was not correct. In their 2003 joint article in Journal of Dracula Studies, Elizabeth Miller and David B. Dickens criticized McNally’s and Florescu’s peculiar rendering, as Anthony Hogg reported in Vamped. Miller spoke of a “far-fetched theory” and of a “remarkably liberal translation of the original German.” Readers who are used to her radical vocabulary in Dracula: Sense and Nonsense (2000; 2006) will note that this phrasing is surprisingly mild. While he was taking his meal. So far, so good—or, with regard to McNally’s and Florescu’s claim, so wrong. “Erring is human, forgiving is divine,” the wise man says. But some suspicion stops me from being divine. First of all: for American, Canadian and British readers, this Early New High German stanza may seem like gobbledygook, but for all who speak modern German, this medieval variant is not so difficult to decipher at all; even as a Dutchman, I understand what is being said here. “Hend” and “Hende.” Extract from Brothers Grimm, DWB, Vol. 4, Section II, lemma HAND, Column 324. Author’s annotations. 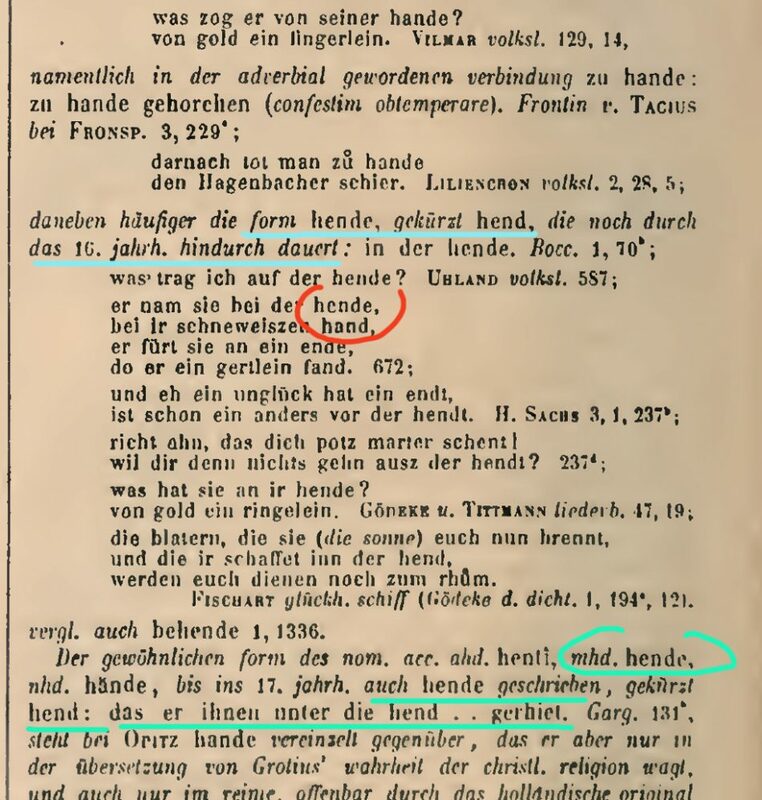 We also find “hende” together with “hand” or “hant” in Ludwig Uhland’s Althoch- und niederdeutsche Volkslieder, mit Abhandlung und Anmerkungen, Liedersammlung in 5 Büchern (1844–5), Franz Magnus Böhme’s Altdeutsches Liederbuch: Volkslieder der Deutschen nach Wort und Weise aus dem 12. bis zum 17. Jahrhundert (1877), Deutsche National-Litteratur: historisch kritische Ausgabe, vol. 13, Deutsches Leben im Volkslied um 1530 (1884) and Albert Julius Wilhelm Daur’s Das Alte deutsche Volkslied nach seinen festen Ausdrucksformen betrachtet (1909). And polite, as befits a man of your position. We won’t have any arguments in our company. The archaic English verb “to hend” was still used by Sir Richard Burton in The Book of the Thousand Nights and a Night, vol. 1 (1885) in the sense of “to grasp,” “to hold” or “to take hold of”—the association with the word “hand” is clear. The word “darjnnen” does not pose a single problem either, as it is simply a spelling variant of “darinnen” (meaning “in there” or “in it”) understood by any German speaker, as this word is still in use in modern German. 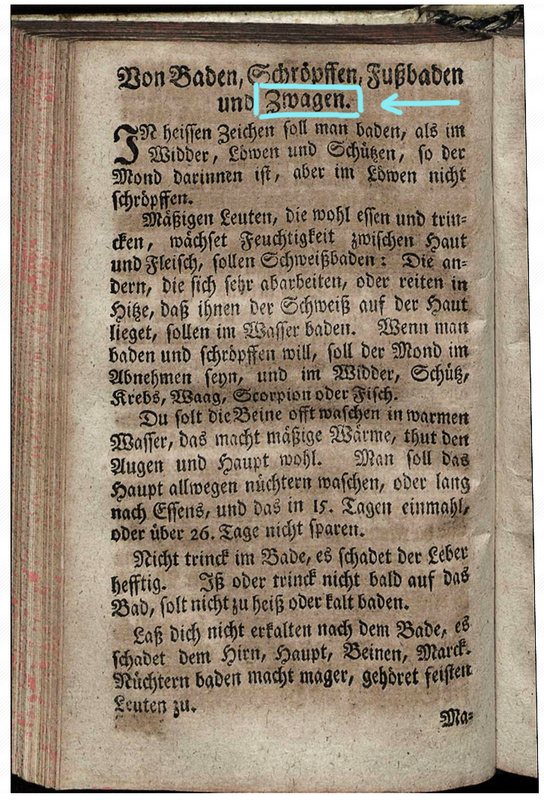 “Zwagen” is explained in the well-known Grammatisch-kritisches Wörterbuch der Hochdeutschen Mundart by Johann Christoph Adelung, Leipzig, 1793-1801, reprinted in 1970 by Georg Olms Verlag, Hildesheim and New York. And of course, we also find the term in the mentioned Deutsches Wörterbuch by Jacob and Wilhelm Grimm. Note the use of “zwagen.” Fragment from Hans Sachs’ Das Hellbad. Author’s annotation. “Zwagen” again. Fragment from Peter Creutziger’s Neu-aufgelegtes Planeten-Buch (1736). Author’s annotation. In short, if McNally and Florescu had engaged a halfway competent student of German language, or did some simple research themselves, they never would have arrived at an interpretation that had no basis in the text at all. After all, the transcript of Beheim’s original transcript, kept at the Heidelberg University Library, has been available in bookform at least since 1903. 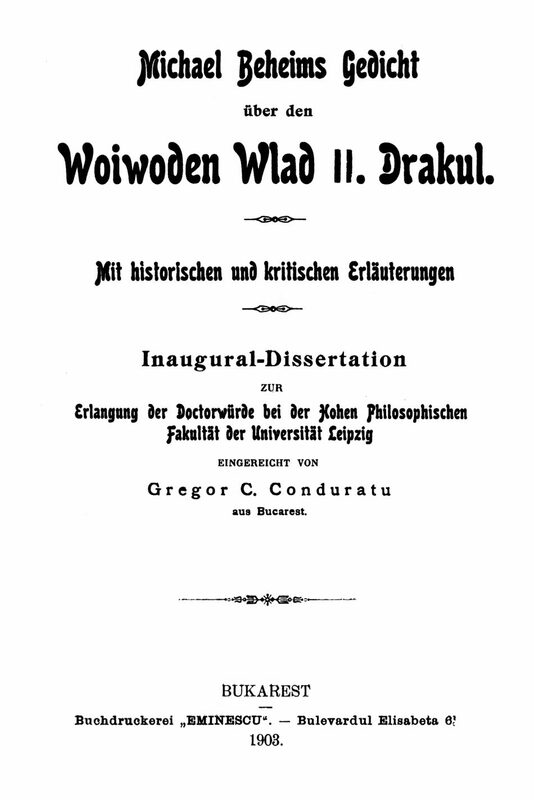 Title page of Gregor C. Conduratu’s dissertation Michael Beheims Gedicht über den Woiwoden Wlad II. Drakul: Mit historischen and kritischen Erlaeuterungen (Bucharest: Buchdruckerei “Eminescu”, 1903). Please note that in modern historiography, the counting of the name “Vlad” within the House of Basarab starts with Vladislav I of Wallachia, ruling 1364–c. 1377. Beheim’s poems is about Vlad III Dracula “the Impaler”, son of Vlad II Dracul. Beheim’s poem. Page 33 of Conduratu’s dissertation, giving the text of the Beheim manuscript in Heidelberg. The relevant section mentioning Vlad washing his hands in blood has been highlighted by me. 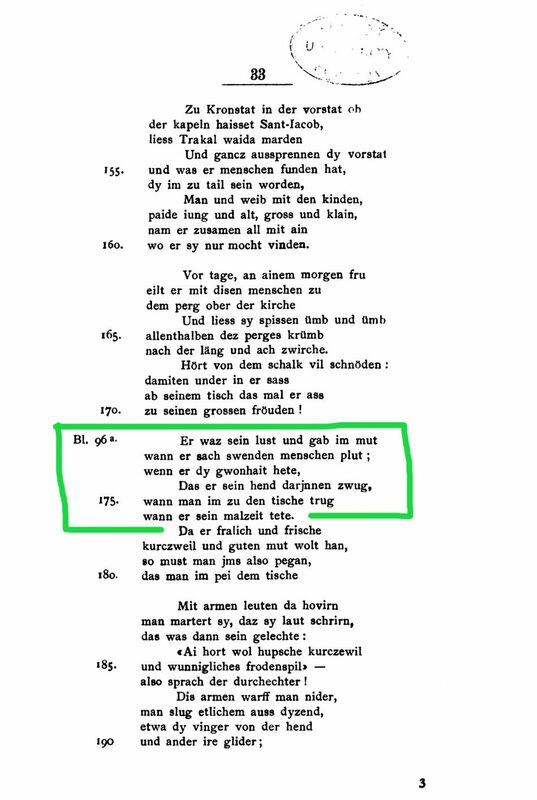 Then, there is the other possibility: that the Professors did not translate the discussed stanza (or have it translated) from the German original themselves, but used an existing translation. But if that’s the case, I have not been able to find any such translation—at least not from German to English. Although the book by William C. McDonald, “Whose Bread I Eat”: The Song-Poetry of Michel Beheim (1981) mentions the poem, it does not provide a translation. But, English and German are not the only languages in this world. What about French? French translation of Beheim’s poem. Extract from Matei Cazacu’s L’histoire du Prince Dracula en Europe centrale et orientale : XVe siècle (1988). Author’s annotations. Picture: Google Books. This is a translation from Beheim’s medieval German poem to modern French, published in 1988—one year before McNally and Florescu launched their stunning statement. 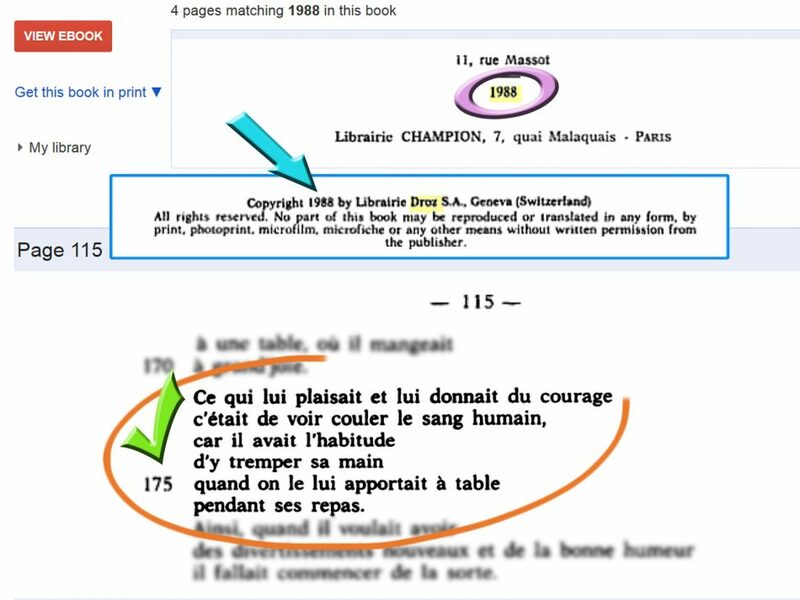 And by the stomach of the eternal cow: The French translation is correct; it corresponds almost word for word with the English translation produced by Ruthner and Buffinga. No wonder, of course, as all worked from the same German text. Now, you will ask me, where did I find it? I found it in a French book, titled L’histoire du Prince Dracula en Europe centrale et orientale : XVe siècle (1988). And who wrote it? Matei Cazacu (b. 1946), a well-known Romanian scholar, specialist for medieval history and Dracula expert, who has lived in Paris since 1975. 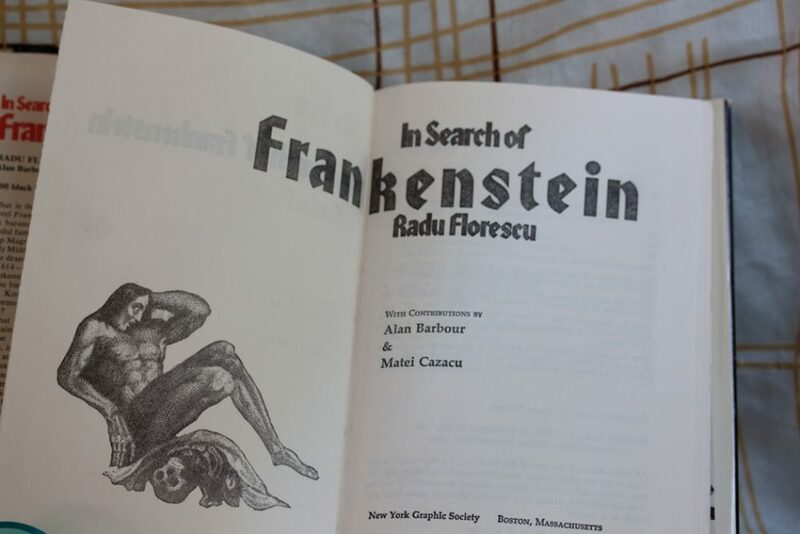 But most significantly, Cazacu was Radu Florescu’s co-author for their joint book In Search of Frankenstein (1975), published by New York Graphic Society; the same publisher where McNally and Florescu already in 1972 published their breakthrough book In Search of Dracula: A True History of Dracula and Vampire Legends. Florescu’s contributor. Matei Cazacu gets a “With contributions by” credit in the first edition of Radu Florescu’s In Search of Frankenstein (1975). Picture: Sheena/Dinosaurs Died of Boredom. 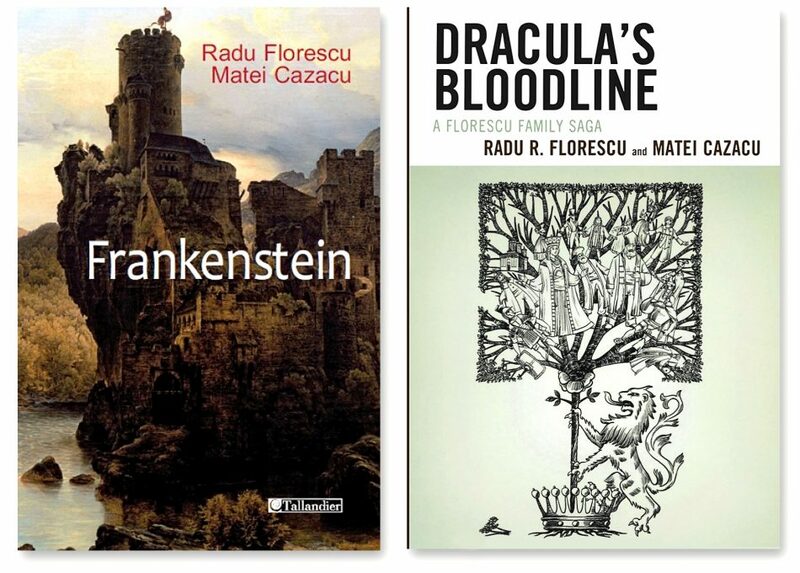 Would it be far-fetched to assume that Florescu and Cazacu, both émigrés born in Bucharest, both specialists for Romanian history, both ploughing the same field of Dracula myth, and co-authors for the Frankenstein book, kept an eye on each other’s work during the 1980s? Would it be preposterous to suspect that Florescu learned about Cazacu’s translation of Beheim’s poem still in 1988, before he and McNally launched their shocking “insight” that a contemporary of Vlad the Impaler had described Vlad as dipping his bread in the blood of his victims? A one-letter change. Would it be possible that a garbled telefax, a typo at the telex machine (email, WhatsApp and Messenger did not exist yet) was the cause of a misunderstanding? Not really—“main” is a female noun (la main) while “pain” is male “ (le pain). The expression “sa pain” instead of “sa main” does not make sense. And would it be plausible that Florescu until 1994, when McNally and Florescu launched their thesis again, did not chat a single time with Cazacu about this stanza in Beheim’s poem, that had caused a sensation in the circles of Dracula scholars? Not a single check with its only known translator before the TV documentary of 1998? The Cazacu connection. Mattei Cazacu gets front cover billing in the Tallandier edition of In Search of Frankenstein (2011) and Dracula’s Bloodline: A Florescu Family Saga (2013). With the publication of DRACULA’S BLOODLINE, A Florescu Family Saga, Professor Florescu (with added expertise provided by his friend and fellow historian medievalist Matei Cazacu) illustrates how decades of painstakingly diligent research can combine to carry on a family legacy – especially when that legacy is of national and international interest. “Friend and fellow historian”—but even in 2013, while working on a joint book that covered, among others, the reputation of Vlad III Dracula, not a single conversation between the two co-authors Cazacu and Florescu occured about the Dark Prince dipping his bread in blood—a conversation that might have motivated Florescu to rethink his former claims—or Cazacu to revise his Beheim translation? I ask, and the reader may judge. So, evidently, while preparing Dracula, Prince of Many Faces, McNally and Florescu drew on Cazacu’s support. But how did they know that Cazacu’s use of Beheim’s poem was “cautious”? This implies that the three men not only discussed the St. Gallen manuscript, but also Beheim’s poem and how to understand it. In 1989, after exchanging such information with Cazacu, NcNally and Florescu stepped forward and announced to their astonished readers that the Beheim poem speaks of Vlad III as dipping his bread in the blood of his victims—which today turns out to be a ludicrous interpretation, yes, a falsification. Should we believe now that McNally and Florescu personally translated the German stanza, or received their translation from another source than from Cazacu, the only known translator of the Beheim poem so far—and then did not discuss their sensational scoop with their friend and helper, who was known to be “cautious”? Ha! To use Elizabeth Miller’s turn of phrase: hogwash! Far more probable, I think, is that the “Dracula professors” knew Cazacu’s translation and decided to “improve” it a little bit on their own account, leaving Cazacu unmentioned as the original translator in order not to incriminate him as a bad linguist. The authors connect their remark about Cazacu being familiar with the Beheim poem with their discussion of the St. Gallen manuscript, not of the poem itself—a clever shift. Neither in Dracula, Prince of Many Faces, nor in the revised edition of In Search of Dracula (1994) do we find the original Beheim manuscript or Cazacu’s 1988 work listed as a source. In the end, no one seems to be responsible for this miserable “translation”—McNally and Florescu covered up their tracks and the “remarkably liberal” translation seems to pop up from thin air. In my humble opinion, I think that we’ve caught Professors McNally and Florescu with their hand in the cookie jar; an act of academic fraud so nicely wrapped, that the large crowd of Dracula adepts, hungry for authentic gory detail, swallowed it whole. It has taken 13 more years to cover up the real progression of events. In fact, it only took three days now, thanks to the Internet and “knowledge by Google,” that allowed me to detect Cazacu’s translation of the Beheim poem by searching keywords from the medieval German text. This pointed me to Cazacu’s 1988 book. Interestingly, Cazacu’s French translation was already mentioned by Weber, referring to Miller as “Margaret Miller.” Evidently, Weber was not aware that McNally and Florescu must have been familiar with Cazacu’s accurate rendering of the poem. Although Weber’s paper almost exclusively focuses on McNally’s and Florescu’s “over-interpretation of the Beheim passage” and Miller’s critique, surprisingly, Weber simply skips the point of the correct translation; after quoting Miller’s objections, her essay continues with “Whatever the translation may be”. Evidently, Weber was unable or unwilling to translate the German text herself, although she reproduces the original German stanza. She also failed to notice that McNally and Florescu launched their claim already in 1989 in Dracula, Prince of Many Faces, fives years before their revised edition of In Search of Dracula (1994), although this fact is expressly mentioned by Miller, in Miller and Dickens’ 2003 paper. A missed chance, as it is only Prince of Many Faces that reveals McNally’s and Florescu’s close cooperation with Cazacu while preparing their 1989 account of the Beheim poem and the St. Gallen manuscript. After discovering this nice little swindle, what really is “unquestionable” in the world of Dracula research any more? “Knowledge by way of Google is a dangerous thing”: Radu R. Florescu and Matei Cazacu, Dracula’s Bloodline: A Florescu Family Saga (Lanham, Md. : Hamilton Books, 2013), 246. While preparing an article for a book about BBEC 2015: Hans Corneel de Roos, “Stereotypes in Reading Dracula — Beyond the Millerian Paradigm,” forthcoming. Anthony Hogg has already discussed the horrendous account: Anthony Hogg, “Was Vlad Dracula a Vampire?” Vamped, Jan. 27, 2015, accessed May 15, 2016, http://vamped.org/2015/01/27/vlad-dracula-vampire/. “[…] Beheim’s poem [was] the source for Van Helsing’s statement”: Radu R. Florescu and Raymond T. McNally, Dracula, Prince of Many Faces: His Life and His Times (Boston: Little, Brown, 1989), 233. “In one verse Beheim described Dracula”: Raymond T. McNally and Radu Florescu, In Search of Dracula: The History of Dracula and Vampires, rev. ed. (New York: Houghton, Mifflin, 1994), 85. “Visually shocked and emotionally charged”: Dana Weber, “Why Dracula Cannot Die: The Invention of a Media-Legend,” Contemporary Legend 8, n.s. (2005): 6. See also Katherine Ramsland, Piercing the Darkness: Undercover with Vampires in America (New York: HarperPrism, 1998), 132. In their 2003 joint article in Journal of Dracula Studies: Elizabeth Miller and David B Dickens, “Michel Beheim, German Meistergesang, and Dracula,” Journal of Dracula Studies 5 (2003): 27–31. this phrasing is surprisingly mild: Exclamations from Elizabeth Miller, Dracula: Sense & Nonsense (Westcliff-on-Sea, U.K.: Desert Island Books, 2006) include: “Nonsense” (18), “Ludicrous” (20), “Absurd!” (28), “Rubbish” (30), “Wrong” (40), “Balderdash” (48), “Give me a break” (58), “Drivel!” (62), “Fabrication!” (67), “Triple trash” (72), “Is this a joke?”, “Enough is enough!” (77). “Oure Hoost tho spak, ‘A, sire, ye sholde be hende'”: Geoffrey Chaucer, “The Friar’s Prologue,” in Canterbury Tales (OUP, 1988), 122. “Our host then spoke, Oh Sir, you should be courteous”: Geoffrey Chaucer, The Canterbury Tales in Plain and Simple English (BookCaps, 2012), 175. The archaic English verb “to hend” was still used by Sir Richard Burton: “Presently the cloud opened and behold, within it was that Jinni hending in hand a drawn sword, while his eyes were shooting fire-sparks of rage.” Richard F. Burton, A Plain and Literal Translation of the Arabian Nights Entertainments, Shammar ed. (Printed by the Burton Club for Private Subscribers Only, n.d.), 27. Their book’s website: “The Authors,” Dracula’s Bloodline, 2013, accessed May 15, 2015, http://draculasbloodline.com/the-authors/. archive.is link: https://archive.is/G5X5Z. “With the help of the research kindly placed at our disposal”: Florescu and McNally, Dracula, Prince of Many Faces, 196. Cazacu’s French translation was already mentioned by Weber: Weber, “Why Dracula Cannot Die,” 7. “over-interpretation of the Beheim passage”: Ibid., 8. “Whatever the translation may be—“: Ibid. She also failed to notice that McNally and Florescu launched their claim already: Ibid., 6–7. “Unquestionably the historical past that Van Helsing in his speech”: Bacil F. Kirtley, “Dracula, the Monastic Chronicles and Slavic Folklore,” Midwest Folklore 6, no. 3 (1956): 135. Kirtley’s article was reprinted in Margaret L. Carter (ed. ), Dracula: The Vampire and the Critics (Ann Arbor: UMI Research Press, 1988), 11–17. Text after citation in Fn 10—“‘Hende’ here meaning ‘courteous,’ from ‘to be at hand,’ with the original meaning ‘to be near the King, ready to serve him'”—inserted into main text. “Or, in modern English,” a line preceding the modern English quotation from Chaucer has been changed to “Which is why a modern English version of the passage reads”. “while working on a joint book covering, among others, the reputation of Vlad III Dracula” changed to “a joint book that covered, among others”. In the decisive line number 174: “Das er sein hend darjnnen zwug” (To wash his hands in it [the blood]). Every German will easily understand the first three …..
With regard to the decisive line number 174: “Das er sein hend darjnnen zwug” (To wash his hands in it [the blood]), every German will easily understand the first three . . .
Hans Corneel de Roos is the editor and translator of Powers of Darkness: The Lost Version of Dracula, due for release on Sept. 6, 2016. He is also the organiser of the Fourth World Dracula Congress (Oct. 20–1, 2016), conducted by the Transylvanian Society of Dracula. A Knight in the Order of Count Dracula (Transylvanian Society of Dracula), Hans is also actively engaged in photography, sculpture, object art, performance. He lives in Munich.